2007.05.10 Thu Music ♪ Comment Tweet This! It's been about a month and a half since Fogma made some significant updates to their jukebox players. Ironically, they did it about a week after I have posted some information on how to operate the damn thing. I guess there isn't that much to know, but you have to at least be able to turn the sound on. The player is set to "mute" by deafult, so if you feel like listening to some music, just unmute the jukebox by clicking on the marked spot. It's as simple as that. Update - Due to many problems connected to Fogma player, I've decided to remove it. Forma player developers seem to think it's pretty funny when their program ignores your settings completly. The player notoriously ignored the "mute on start" setting, among other things. Bye Fogma. You will NOT be missed. 2007.03.25 Sun Music ♪ Comment Tweet This! Finally we get to see it and we get to listen to it. New single from Jarre's upcoming album called "Téo & Téa" is released and premiere date for the album is set to March 26th. Usually I'm glad when an artist like Jarre releases something new. He's been around for ages and he was, and still is, a huge influence within the world of synth music. This time around I'm a bit pissed to be frank. Why? Jarre IS synthetic music. The guy basically commercialised electronic music, and re-invented it a few times since. And don't give me no Wendy Carlos, because I don't care. It's 2007 now and Jarre is all good to go, once again. He's been recording his new album during the last year and now we got to listen to the first single. Now is it just me, or does "Téo & Téa" sound like an avarage club track? On top of that, the main motif bares a striking resemblance to that of "Oxygene 8". Come on Jarre! The album following your '97 "Oxygene" was called "Metamorphoses". Doesn't that mean you're supposed to be making something new? It does. So where did this club track come from? And did you have to copy your own work from ten years ago? Are you really out of ideas? Next time steal someone elses music, not your own. And by the way, the photo of Oxygene vinyl is the actual 1976 french release, first pressing, in a mint condition. And yes, I am a total nerd. 2007.03.04 Sun Music ♪ Comment Tweet This! So I got myself a blog jukebox. As if the visuals alone weren't enough, from now on you'll have some sound too. It might not suit everybody's taste [hell, it doesn't even suit mine, for the most part], but it's just something I wanted to take for a test spin. As far as I know, the jukebox should start by itself. If the music bothers you, you can always turn it off. Just check out the essential features on the picture below [click to enlarge], if you haven't worked all that out by yourself already. The music is played at random, but sticks to trance, ambient, house, progressive and alike. I totally dig the melodic ambient tunes. That's why I got the jukebox in the first place. If you're into death metal, grind metal, trash metal, punk metal, heavy metal, light metal or metal metal, just mute the thing and pop your favorite CD into the stereo. 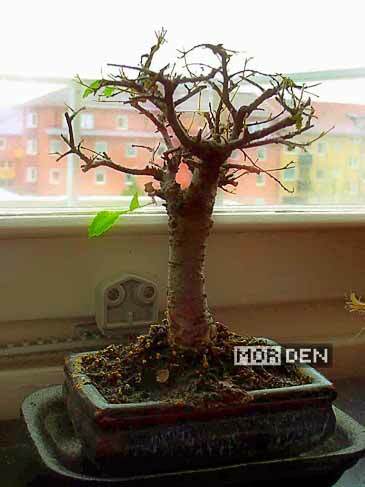 In other news, my bonsai tree is feeling a bit weak lately. Despite the proper watering and care, it started to lose leafs. This condition is most likelu caused by the fact, that it stands on my window with the radiator directly under it. During the colder days it takes all the heat the radiator produces. Bummer. I hope it gets better. 2007.02.25 Sun Music ♪ Comment Tweet This!